Today, for the first time since I was a little kid, it wasn’t raining. Okay, really, it’s been over 2 weeks since the sun has graced us with its presence, but that is a really long time for someone who is convinced she is partly solar-powered. Like many of us sun-deprived zombies, I went outside the first chance I could. Today’s run was awesome! It wasn’t cold, so I was out in a tshirt instead of a long-sleeved shirt, and I actually worked up a sweat. I was bound and determined to do the full 5K, and I think I could have made it, too, but at around my 2.25 (ish) mark, a fox crossed the road, about 100m in front of me. I slowed down and watched to see what the fox would do. It stopped. And sat. And faced me. And stared. And frankly creeped me out. So I crossed the road, thinking it would just saunter off into the woods. Nope. He turned and faced me. And kept staring. What up fox? Geez. I am not an animal expert. I do not know foxes. 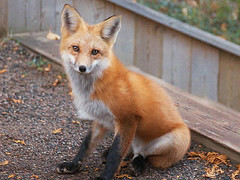 I had no idea what foxes do if people run by them, or even walk by them, or even look at them, really. So I admitted defeat, tipped my head to the fox, and turned around. I walked for a bit as fox kept watching me. Then I started to run again, turning my head at the odd interval to make sure I wasn’t being followed. I wasn’t. The fox went back into the woods. About another km or so up the road, as I was passing by the cows’ fields (where I have yet to see a cow this year! ), I encountered another fox. Apparently 3:30PM is Fox Happy Hour on the Ferry Road or something. Anyway, this one really wasn’t near me and didn’t turn to face me or anything, so I kept running, just keeping a close eye on it. So, I think I clocked around 4.5k. Knowing I probably could have made it that extra 0.5k makes me almost as happy as if I had done it. Do many of you encounter wildlife (specifically foxes) when you’re out running? What’s the best thing to do? Was I being smart or a wuss? You might have been a wuss!! The little guy was probably looking for food or to play with you. We have fox hour every day her around 4p.m and there is usually the same fox that santers across the garden to pee on the shed wall, then on out bush, then in my herb garden!! !I am no expert but even when we meet foxes walking the dogs, they mainly just sit and watch us to check it all out – you know, the sly as a fox thing!! Great going on your running! !